This is the Arduino Uno R3. In addition to all the features of the previous board, the Uno now uses an ATmega16U2 instead of the 8U2 found on the Uno (or the FTDI found on previous generations). This allows for faster transfer rates and more memory. No drivers needed for Linux or Mac (inf file for Windows is needed and included in the Arduino IDE), and the ability to have the Uno show up as a keyboard, mouse, joystick, etc. 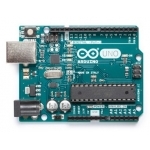 The Arduino Uno is a microcontroller board based on the ATmega328. 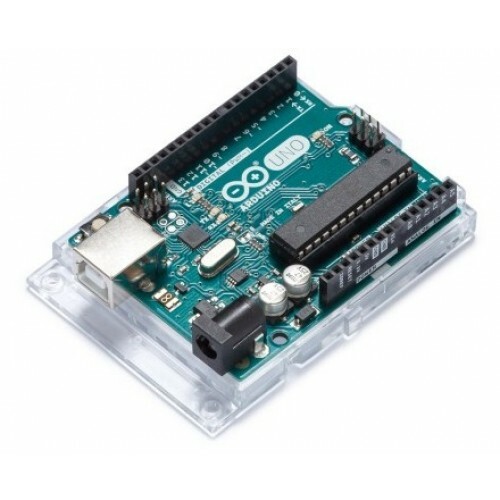 Arduino is an open-source, prototyping platform and its simplicity makes it ideal for hobbyists to use as well as professionals. 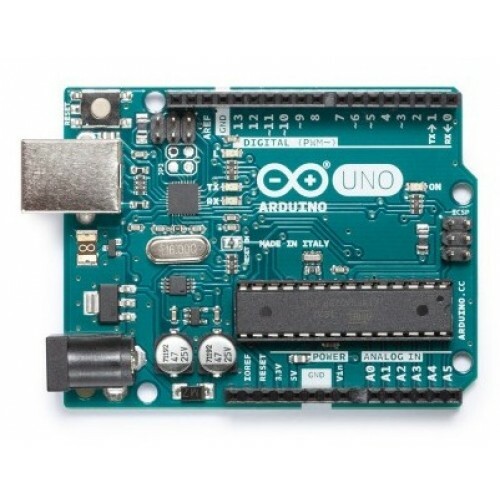 The Arduino Uno has 14 digital input/output pins (of which 6 can be used as PWM outputs), 6 analog inputs, a 16 MHz crystal oscillator, a USB connection, a power jack, an ICSP header, and a reset button. It contains everything needed to support the microcontroller; simply connect it to a computer with a USB cable or power it with a AC-to-DC adapter or battery to get started. The Arduino Uno differs from all preceding boards in that it does not use the FTDI USB-to-serial driver chip. Instead, it features the Atmega8U2 microcontroller chip programmed as a USB-to-serial converter. "Uno" means one in Italian and is named to mark the upcoming release of Arduino 1.0. The Arduino Uno and version 1.0 will be the reference versions of Arduno, moving forward. 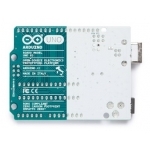 The Uno is the latest in a series of USB Arduino boards, and the reference model for the Arduino platform. The Arduino open-sourced IDE drivers can be downloaded for free and we have created a download and installation tutorial for the Windows XP platform.